While I am incredibly sad and miss her terribly from the moment her spirit left us, my heart is overjoyed that she is at peace. All of you support is greatly appreciate and please forgive me for responding to messages with great delay. Natividad also known as Nati and Nellie, passed peacefully into the next world midday on Sunday surrounded by loved ones. Mama, as she was also affectionately known to everyone, was incredibly strong, deeply devout and fiercely loyal with a dry quirky sense of humor. 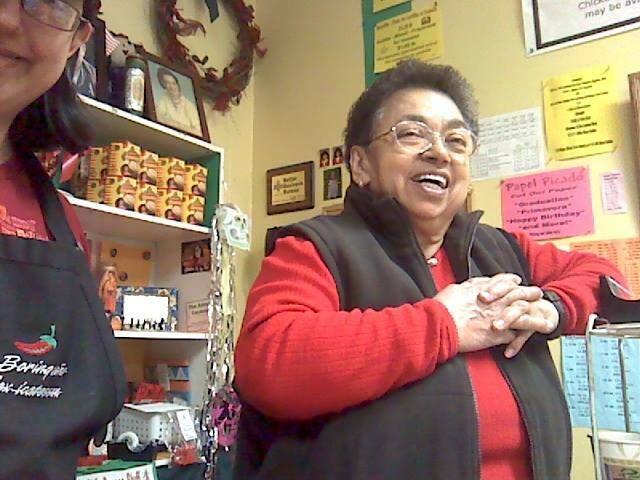 Her strong work ethic started at a very young age, when her mother Rosa Lopez founded La Borinqueña Mex-icatessen in 1944 when Mama stood on a box so she could reach the register to work the counter. She later met her husband, Antonio Ramos, when he was hired to work as a baker in the Mexican food store. As a married couple, they took over in 1956 and Mama worked tirelessly as a business owner and matriarch of her family. She later became well known for her stories, recipes, words of encouragement, and hugs. Most recently, Mama was tooling around her beloved hometown of Oakland with her daughter Tina and her little dog Louie. She was amazed by all the changes she experienced first hand, whether it was going to movies with her younger sisters at the Star Theater with a quarter or visiting the farmers' market in the neighborhood she grew up in that over time had been renamed Old Oakland. Nati got a kick out of seeing how her town had changed into this sleek modern place yet she always greeted everyone with a warm old-fashioned hello. She loved being at the family home in the Laurel District watching Jeopardy every day but equally enjoyed seeing the bright city lights at night, going on excursions with her dog, having a scoop of strawberry ice cream at Loard's, and soup. Friends and family are invited for visitation Thursday, October 27, 2016 from 11am to 6pm with the Rosary to follow from 6-7pm at Fouche's Hudson Funeral Home on Telegraph Avenue. A Celebration of Life on Friday, October 28, 2016 with a 10am Funeral Mass at St. Lawrence O'Toole Church on High Street with burial to follow at St. Mary's Cemetery. Mama was a charitable person, while flowers are lovely, donations in her name to the American Heart Association or the National Kidney Foundation are equally appreciated. After 4 generations of family and 71 years of business, we are closing forever at La Borinqueña Mex-icatessen. This is our final week of business, Tuesday—Friday, July 28-31, 2015 from 9am to 3:30pm each day. Serving traditional Mexican American food specializing in artisan tamales made with corn masa stone ground in house. Located at 582 - 7th Street in the Old Oakland District. La Borinqueña is open for lunch Tues through Sat, July 31st from 9am to 3:30pm. For general information, FAQs and menus, visit tamalegirl.com or call 510/444-9954. Advance orders accepted by phone only! Tina Tamale Catering & Special Events is also ending on July 31 and La Snackeria has already shuttered.